As a company we decided we should only sell the most ethically-sourced tinned fish available. The mackerel are fished off the coasts of Spain and Portugal by small fishing communities that use small boats to net their catch. They go out at night and return the following morning, and use small net sacks that don't trap unwanted or excess marine life because the mackerel are located using special infrared methods. The nets are closed once full and taken on board, and no drag nets or factory ships are used. The mackerel are never frozen - either at sea or on land. 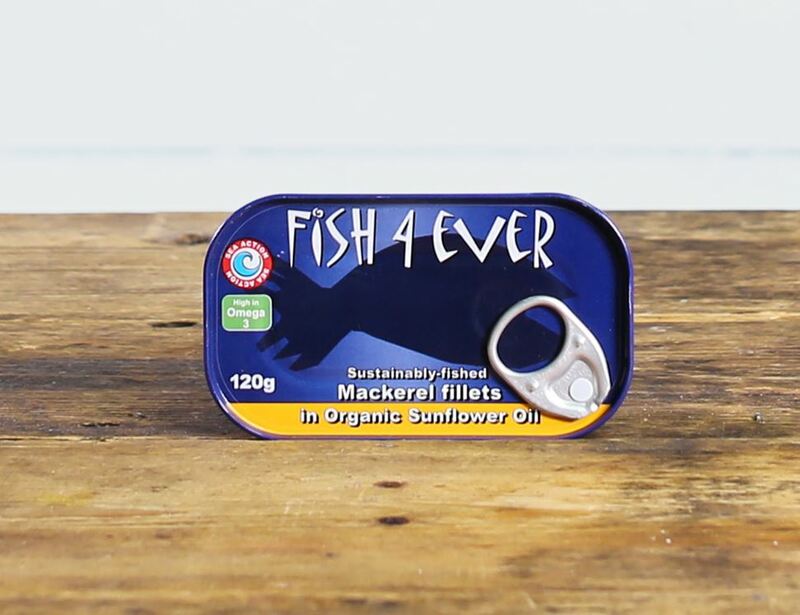 Fish 4 Ever is the first and only range of tinned fish in the UK to promote explicit sustainability criteria. Fish 4 Ever do not endanger dolphins, turtles, birds, sharks or albatrosses. To top it all off, they also use organic, naturally grown land ingredients. Mackerel fillets [fish] (65%), Sunflower oil*, Salt * = produced to organic standards. For allergens, including cereals containing gluten, please see ingredients in bold. Ready to eat so just pull back that ring-pull and get stuck in! Great with a jacket potato or even spread on toast with a sprinkling of black pepper. Store in a cool dry place but wrap in plastic and refrigerate once opened. Suitable for home freezing.